Specifically designed to counter the hardening and lack of grip brought on by the cold weather BMW Winter tyres keep you safe on icy or snow-covered roads. They last longer and provide cost-effective winter monitoring. With the BMW Tyre Hotel you can also have your summer wheels safely stored when you change to winter ones and vice versa. When the temperature dips to 7°C or below, standard tyres harden and no longer provide optimum adhesion, compromising performance when accelerating, braking and cornering. You can also download our BMW Winter Driving guide which will help keep you safe on the roads this winter. 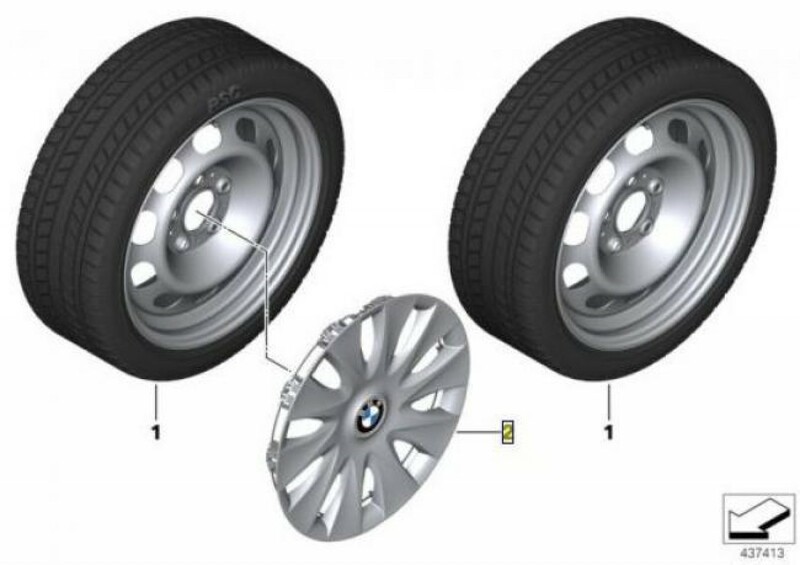 Example of a basic steel winter wheel & tyre set for a BMW 1 Series without M Sport or M Performance brakes, with tyre pressure indicator, with run flat tyres, and plastic wheel trims, fitting (FOC), storage is available (at additional costs) prices from £1,020.40 incl. vat total. Part Numbers 36112289710 x4 Winter wheel, & 36136791806 x4 trim. Contact our Reservations Team to book your car in for Winter Wheels and Tyres on 0800 9996364 or get a quote for Winter tyres for your car above.